One of the goals I set for myself this spring is to draw not just objects, but scenes. So one day, while sitting in an atrium waiting for my class to start, where I sit every day, I decided to draw the atrium and the students in it. I gave myself no more than 15 minutes; I finished it in 10. I sit in this room several times a week. 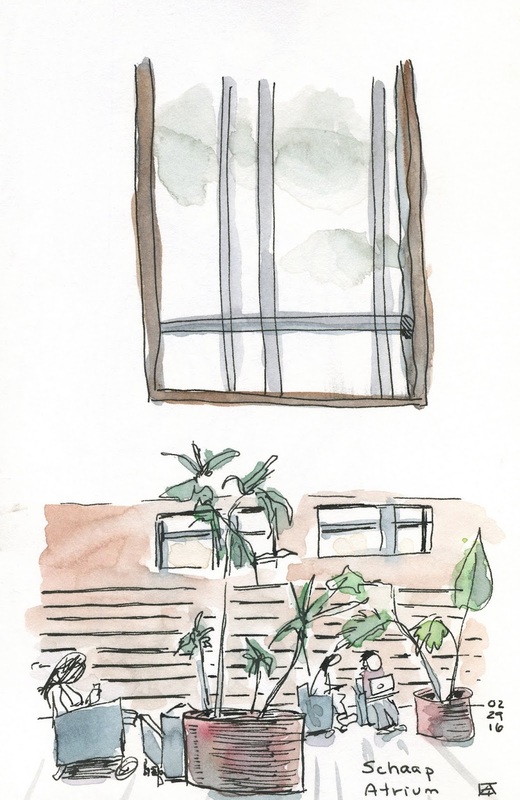 But before I drew this, if you had asked me about the plants, the color of the furniture, the paneling on the walls, even the enormous window, I couldn't have told you. Usually when I'm there, I'm thinking about my upcoming class. Now I could tell you about that room. And, my class went well afterward. I don't need to sit there and over-prepare! Drawing might have prepared me better, anyhow! I got centered, in the moment, relaxed, and observant. A better way to teach.